NL GROUP Services is a professional company specialising in commercial window cleaning services in Milton Keynes. We have built a strong reputation for reliability and excellent customer service. 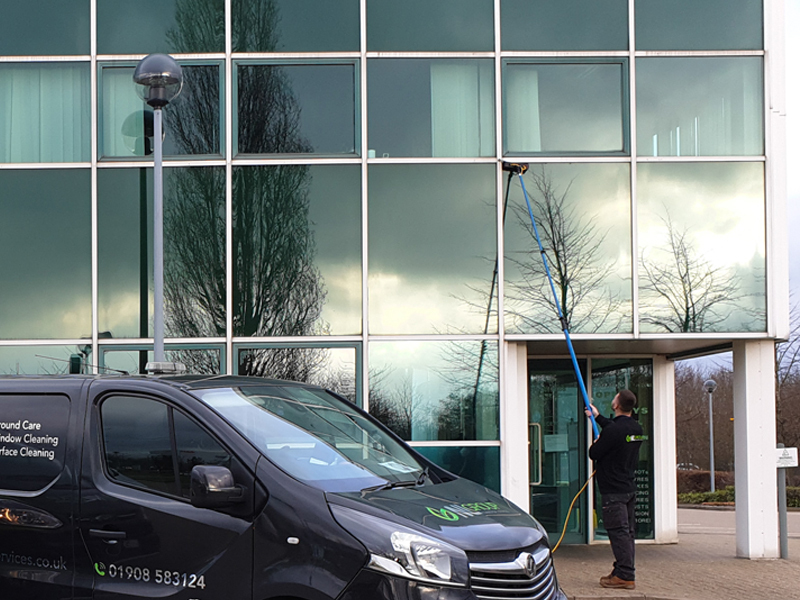 We are very flexible and undertake all aspects of window cleaning in the commercial sector. Our window cleaners will work to suit your requirements whether that may be a frequent weekly clean or a one off basis. Using the latest window cleaning method, the reach and wash water fed pole system, we are able to clean your windows up to a range of heights without the need to use ladders. Our reach and wash window cleaning system ensures complete reliance with the latest health and safety regulations for your protection. We specialise in the revolutionary Pure water-fed pole cleaning system, giving us access to heights of 80ft without any additional or expensive equipment, saving our customers around 40% on their cleaning costs on average. Using this system passes savings directly onto our customers as there is no additional cost on the fitting and yearly maintenance of eye-bolts, ladders ties or the hiring of access equipment. Store fronts, show rooms, office buildings, restaurants or housing associations. Whatever business you run we can provide a suitable window cleaning schedule to meet your needs and budget. We ensure that all our commercial window cleaning staff wear high visibility tabards and that they adhere to your health and safety policies as well as our own when cleaning your premises.